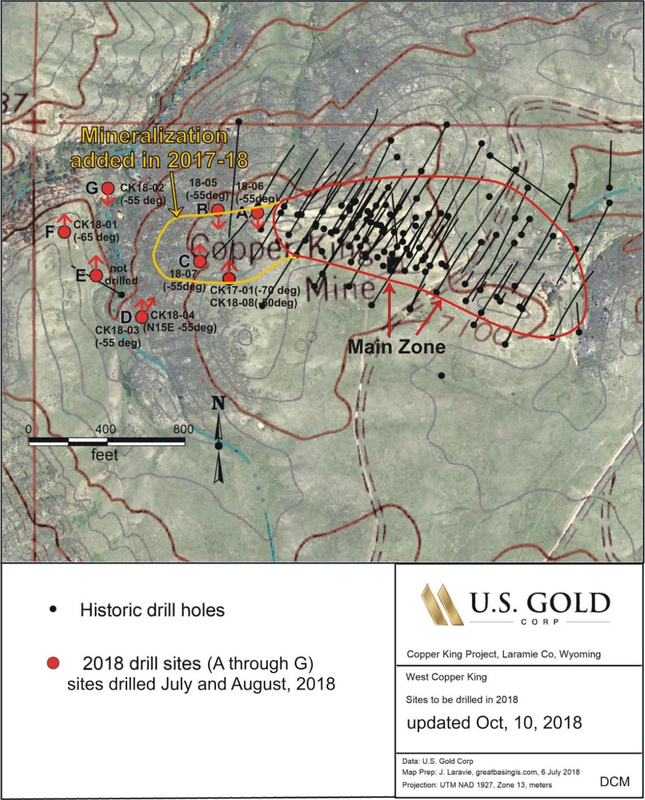 ELKO, Nevada, Oct. 17, 2018 /PRNewswire/ -- U.S. Gold Corp. (NASDAQ: USAU) today is pleased to announce the results of the recent eight-hole reverse circulation drilling program that followed up the discovery of this mineralization in last year's drill hole CK17-01rc, reported January 30, 2018. These eight new holes (see Table 1 below) indicate that the Copper King mineralization extends to the west, at least 200 meters, and maintains the historically measured and reported widths and depth to the deposit (see updated Copper King deposit map link below). Dave Mathewson, Vice President of Exploration for U.S. Gold Corp., stated, "Our 2018 drill program at Copper King has added additional mineralization to the project. Copper King has had a long history of several exploration programs conducted by numerous companies, but U.S. Gold Corp. is the first company to significantly expand the potential in many years. The more time I spend on the Copper King property and looking at the data, the more I am convinced that we can continue to increase the overall metal endowment of the project. We are looking forward to populating the DataMine exploration model with all the historic; and this recent exploration drilling information. We will utilize this new updated digital exploration model to assist us with identifying additional Copper King deposit extensions and high-grade target zones within the deposit. We are also currently re-examining all existing area exploration data for the purpose of identifying additional new target opportunities in the area." Prior to this recent drilling, and these reported results, an updated Preliminary Economic Assessment (PEA) for the historic Copper King deposit was conducted by Mine Development Associates (MDA) and reported January 11, 2018. This PEA provided a Pre-Tax NPV of $178.5 million and an IRR of 33.1%, based on $1275/oz Au and $2.80/lb Cu. This recent drilling has enlarged the deposit size and metal content. The PEA also does not include the values of other metals inherent to the deposit, including zinc and silver. U.S. Gold Corp. has commissioned DataMine Associates, of Denver, to assist in the building of an expanded exploration model for the Copper King deposit. This model is designed to look more thoroughly at the deposit, especially with respect to its boundaries, internal high-grade zones, and the other metals of value which are present, but that have not been previously examined, and factored into the economics of the deposit. With this model, that is in progress, additional exploration effort to enlarge and prospectively enhance the deposit value will be conducted. Edward Karr, President and CEO of U.S. Gold Corp., stated, "We are encouraged with our 2018 Copper King exploration drilling results. The consistent grade of mineralization encountered bodes well for a future production decision. The presence of silver and zinc could also increase the overall future Copper King value. Our future exploration programs will continue to attempt to expand the overall resource and Net Present Value of the project." U.S. Gold Corp. is a publicly traded U.S. focused gold exploration and development company. U.S. Gold Corp. has a portfolio of development and exploration properties. Copper King is located in Southeast Wyoming and has a Preliminary Economic Assessment (PEA) technical report, done by Mine Development Associates. Keystone is an exploration property on the Cortez Trend in Nevada, identified and consolidated by Dave Mathewson. For more information about U.S. Gold Corp., please visit www.usgoldcorp.gold. Forward-looking statements in this press release and all other statements that are not historical facts, are made under the safe harbor provisions of the Private Securities Litigation Reform Act of 1995. These statements involve factors, risks, and uncertainties that may cause actual results in future periods to differ materially from such statements, including statements related to the potential increase of the overall metal endowment of the project and use of updated digital exploration model to assist in identifying deposit extensions and high-grade target zones. There are a number of factors that could cause actual events to differ materially from those indicated by such forward-looking statements. These factors include, but are not limited to, risks arising from: whether or not U.S. Gold Corp. will be able to raise capital through this offering or consummate this offering, the satisfaction of customary closing conditions, prevailing market conditions, the anticipated use of proceeds from the offering and the impact of general economic industry or political conditions in the United States or globally. A list and description of these and other risk factors can be found in the Company's most recent Annual Report on Form 10-K, Quarterly Reports on Form 10-Q, and Current Reports on Form 8-K filed with the Securities and Exchange Commission, which can be reviewed at www.sec.gov. We make no representation or warranty that the information contained herein is complete and accurate and we have no duty to correct or update any information contained herein. We may use certain terms on this press release, which are defined in Canadian Institute of Metallurgy guidelines, the guidelines widely followed to comply with Canadian National Instrument 43‐101‐‐ Standards of Disclosure for Mineral Projects ("NI 43‐101"). We advise U.S. investors that these terms are not recognized by the United States Securities and Exchange Commission (the "SEC"). However, the SEC normally only permits issuers to report mineralization that does not constitute "reserves" by SEC standards as in place tonnage and grade without reference to unit measures. Note that a preliminary economic assessment is preliminary in nature, and it includes Inferred mineral resources that are considered too speculative geologically to have the economic considerations applied that would enable them to be classified as mineral reserves, and there is no certainty that the preliminary assessment will be realized.